Using computational theory as well as x-ray and neutron scattering scattering measurements, the CDAC group at Caltech has shown that the alloy FeTi undergoes an unusual change in phonon dynamics associated with changes in its electronic properties at high temperatures. This research effort included current CDAC student Fred Yang and CDAC Academic Partner Brent Fultz, as well as former CDAC students Lisa Mauger, Matt Lucas, and Jorge Muñoz. FeTi is a thermodynamically stable, nonmagnetic and intermetallic compound with a melting point of approximately 1600 K. The material is of interest for its hydrogen adsorption capabilities and for its mechanical properties. Nuclear resonant inelastic x-ray scattering (NRIXS) measurements at APS, Sector 16 (HPCAT) as well as inelastic neutron scattering at SNS were used to probe the phonon dynamics. The results show an anomalous thermal softening of one particular mode in FeTi that cannot be explained by either phonon-phonon or electron-phonon interactions calculated at low temperatures. 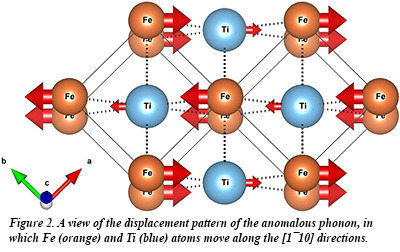 The computations show that the Fermi surface of FeTi undergoes a novel, thermally driven electronic-topological transition, in which new features of the Fermi surface arise at elevated temperatures. This work illustrates both the importance of synergy between theory and experiment, and in particular the use of multiple scattering techniques, for understanding the coupling of phonons and electronic properties of materials in extreme environments. 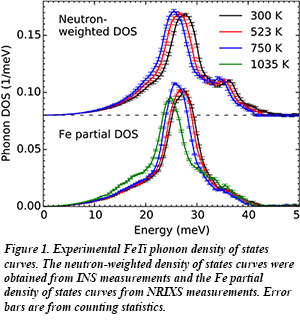 The work was supported by multiple DOE-BES sources, DOE-NNSA, NSF, and SNIC [F. Yang et al, Phys. Rev. Lett. 117, 076402 (2016)].